* Configuration of certain parameters are made much easier using Maretron DSM250, DSM410, or Maretron's free N2KAnalyzer® program running on a PC and connecting to the NMEA 2000® network through a USB100, or IPG100 gateway. Maretron's SSC300, implementing the second generation of Maretron's award-wining compass technology, is a solid state, rate gyro electronic compass that provides better than 0.7° heading accuracy through ±45° of roll and pitch angle, and better than 1° roll and pitch accuracy in static conditions. Each SSC300 is factory calibrated for maximum accuracy. It delivers precise, reliable heading information ten times per second, plus vessel attitude including pitch and roll readings once per second. A micromachined 3-axis rate gyro is used, in conjunction with a 3-axis accelerometer, by advanced stabilization algorithms to provide accurate, stable readings during dynamically changing conditions such as hard turns or rough seas, making it an ideal heading sensor for autopilot or radar overlay applications. 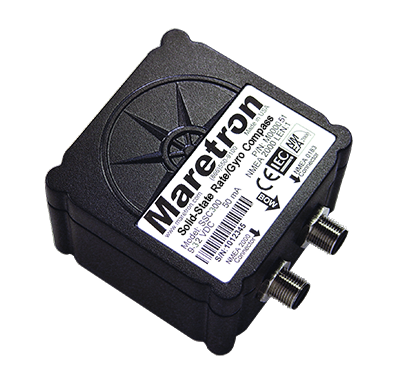 Maretron's SSC300 is certified to the NMEA 2000® network standard and compatible with the NMEA 0183 digital interface standard. It connects directly with any NMEA 2000® network and with the optional NMEA 0183 cable accessory, with NMEA 0183 listeners to share information with navigational software, chart plotters, autopilots, and dedicated instrument displays - including Maretron's N2KView® vessel monitoring system, or Maretron's DSM250 / DSM410 color graphics displays. This connector is only required if the SSC300 is not connected to an NMEA 2000 network. It is used to supply power to the device when connected only to NMEA 0183.